Welcome to condo 14-4, located on the second fairway of a champion golf course. Take a break from the hustle of the city and relax on the peaceful beach. 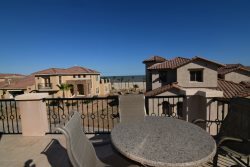 You can enjoy the beautiful sunsets from several patios or the private master bedroom balcony. This home boasts over 1900 sq ft of living space and very well designed interior to feel spacious. Beautiful travertine floors and upgrades throughout. This villa has two master bedrooms. The Master bedroom on second floor has a super comfortable King size bed. There are dual (His & Her) sinks in both master bathrooms. Second master suite on first floor bedroom has a Queen size bed. A third bedroom on the second floor has two twin beds. All bedrooms are completely separate and private behind closed doors. One of many unique features you will love about this rental is the view overlooking the golf fairway which stretches all the way to our private beach. Our private beach is just a short walk away. Our community has several outdoor activities for you to enjoy. We already mentioned the golf course; note that this is a full 18-hole golf course. Golf clubs and balls are available for rent at the on-site golf shop. Feel like going for a swim - several swimming pool options are available to you. Of course, the private beach is always an option - the shallow waters makes it very safe for all ages. Have specific questions? We're just a phone call away. So get your bags ready and get your awesome San Felipe vacation started.